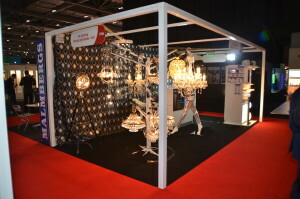 For the first time, SLB decided to be a part of the Lux Live exhibition which happens annually at the ExCel centre in London. It is Europe’s biggest lighting exhibition which attracts thousands of professionals who come to learn more, see more and get inspired! We thought that we had to partake in this exhibition at least once! And we are so glad we did; LuxLive 2015 resulted in being the biggest exhibition to date with over 300 exhibitors and at least 7000 attendees. The exhibition as a whole saw an increase of 5% on previous years! (… we’d like to think that’s because we were in attendance!). LuxLive is an “an unrivalled showcase of the best the industry can offer in terms of the latest technology, developments and expert thinking”. It is an exhibition where people go to get better ideas, find out how they can save more energy and money and how best to make the most of lighting in their specific area of interest. It has been awarded the Best Trade Launch Show by the Association of Event Organisers, which just proves how successful and useful many find it! 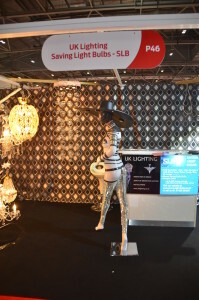 The great thing about the exhibition is that it tackles lighting issues that people in different sectors will be having difficulties with and wanting solutions for; there are people and exhibitors from all different sectors who represent lighting from areas such as retail, the workplace, hospitality and leisure, education, healthcare, industrial, outdoor and street, transport, residential developments and emergency lighting. Within the days of the exhibition, there are also discussions that the attendees can participate in to get their ideas across while also hearing from other people’s ideas. Bigger companies who have previously experimented with ideas and lighting techniques will also present case studies to portray what worked well and what didn’t in putting some of these ideas to practice. The exhibition gives many the opportunity to learn about the latest technologies that can be used in the different sectors, and hear about them from peers who have put it into practice and can tell you more about it! There is always the fear and concern that switching your lighting can change an atmosphere or lessen the desired effect of usage in the workplace, school or other areas which rely of lighting to function. This doesn’t have to be the case though and it is at LuxLive that you can find this out and learn so much more – widen the horizons so to speak. It is an exhibition which gives! Gives information, helps you save money on your energy bill and simply wants to help give you the knowledge on how to better your lighting for your professional environment! The exhibition also gives to the exhibitors as well as the attendees; as exhibitors, we too were also able to discover new and exciting developments that are happening in our area, see from competitors, how they do things differently, while also making connections with other people in the same sector to work together ensuring customers could get the best advice and products they were looking for. All in all, we realised why it is such a popular exhibition! We were fortunate in the positioning of our stand as it was a corner one which meant that attendees would often meander into our stand to see what we were advertising and keen to show off! Our sister company Classical Chandeliers were also with us to add some sparkle to our stand and show off what they also offer. The main attraction was our lady; who sparkles and causes a stir wherever she goes! Especially to designers who are interested in something different which is unusual but at the same time mesmerising! 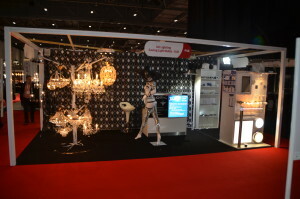 We were very thankful to have her manning the stand with us at LuxLive! Previous PostSolar LightingNext PostDo Energy Saving Light Bulbs actually save you money and energy?